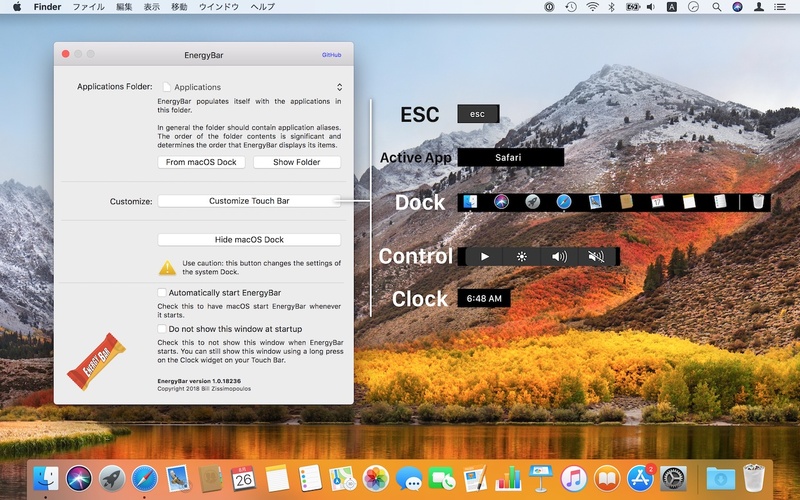 MacBook ProのTouch BarにESCキーやDock、コントローラー、アクティブアプリ、時計を表示してくれるユーティリティアプリ「EnergyBar」がリリース。 | AAPL Ch. The default placement of EnergyBar widgets allows for consistency and memorization of your Touch Bar use. The areas around the Esc key and above the Delete key have been kept non-functional to alleviate the problem of inadvertent tapping. At the same time EnergyBar allows for customization so that you only have your favorite widgets visible.